Colony inspections usually concentrate on the brood box. This is where all the action is. This is where the queen is and where there needs to be sufficient space for the colony to expand. Or, if times are lean, sufficient stores and pollen to survive. In contrast, the honey supers get no more than a cursory glance. There’s little of interest going on up there until it’s time to harvest the honey for extraction. If the supers are light there’s nothing more to do other than hope for a good nectar flow in the future. In contrast, if they’re really heavy they might be ready to remove for extraction. If the frames are all capped the honey is ready. Usually the supers are not heavy enough (a full super weighs something like 25kg) and they often don’t even get a glance, instead being bodily lifted off and left in a pile while the brood box is inspected. Nectar has a high water content which the bees evaporate off during the production of honey. If they didn’t get rid of the water the stores would ferment. 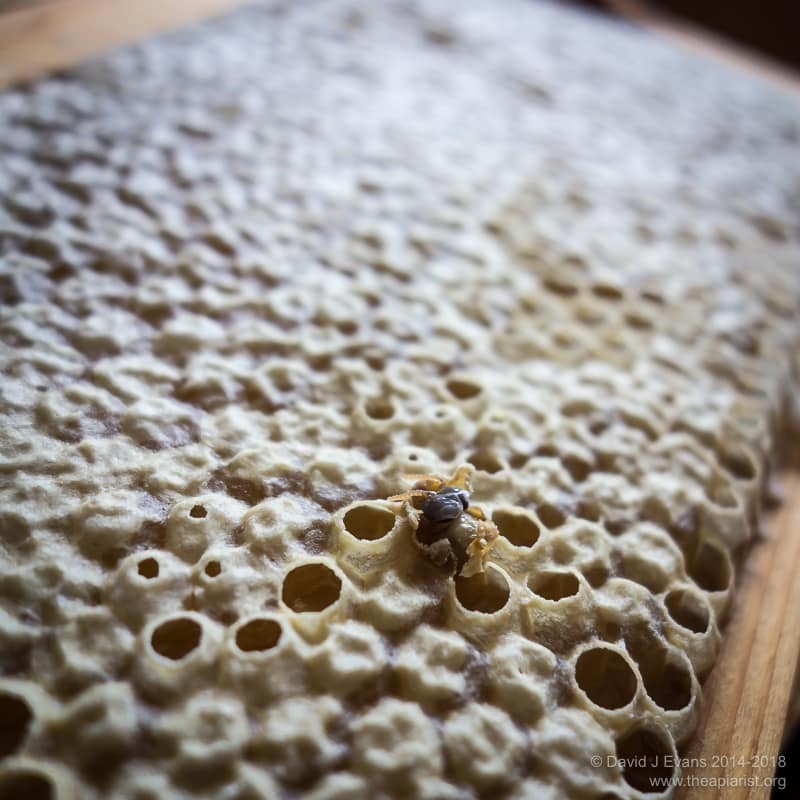 Since honey is hygroscopic they then add a wax ‘cap’ to the honey-filled cell to protect their stores for the winter. Nectar is generally stored in the supers, starting in the middle of the middle frames and moving towards the periphery. This is the warmest part of the hive and presumably the easiest to evaporate water from. 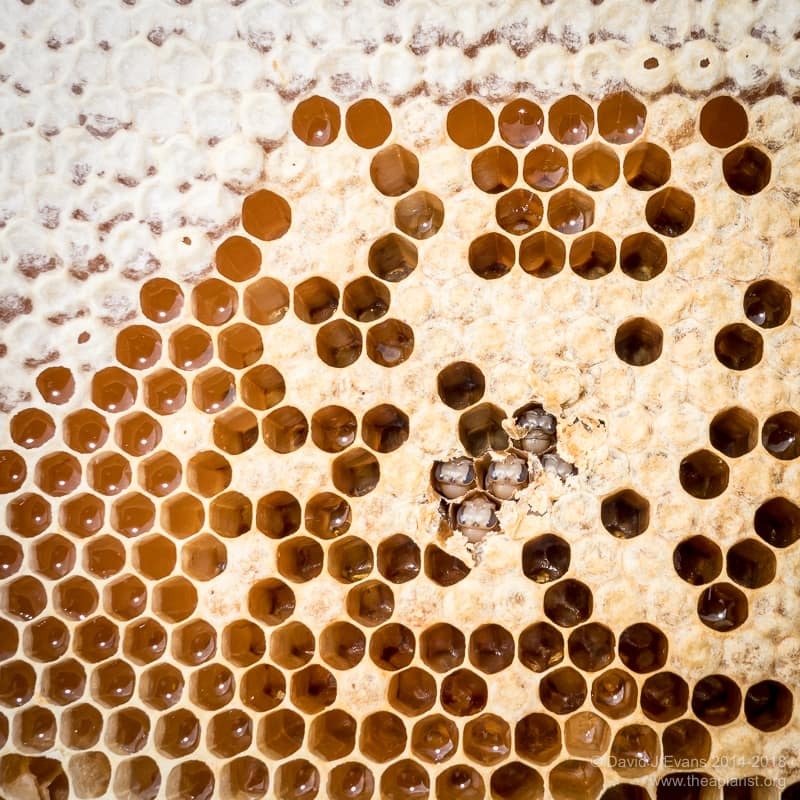 Therefore, the central frames in the super are most likely to contain capped honey stores. All I do when checking a heavy super is to first briefly look at the central frame to see if the stores are capped. If they are not then there’s no point in looking anywhere else in the super. If the central frame is capped then it’s worth looking to see if the outside frames are as well. If so a clearer board can be placed below the super and you can take the honey for extraction. Actually, there’s a bit more complexity as sometimes the honey is ready to extract, but isn’t capped. I’ll deal with that another time. The point I’m (slowly) trying to make is that supers are rarely checked in any detail … until they’re full. It’s therefore interesting what turns up when you do remove them for extraction. With a strong colony, the bottom super i.e. the one immediately above the queen excluder, often has no honey stored in a semi-circular area immediately above the brood nest. Sometimes the edge of this clear area, adjacent to the honey, contains a band of stored pollen. This clear area indicates that the colony need more space. The workers are keeping it clear for the queen to lay, but the queen excluder prevents her from accessing it. Sometimes you can get the bees to backfill this area by switching the super with one higher in the stack. It’s not unusual to find a very few scattered capped pupae in a stack of supers. These are almost invariably drone pupae, irrespective of whether the drawn super comb is on worker or drone foundation. In ~24 supers I extracted last weekend I saw three or four. I’ve always assumed that these were due to laying worker activity. There are always a few laying workers in a colony, but their numbers are suppressed by a pheromone produced by unsealed brood. Laying workers can be a significant problem in queenless and broodless colonies. Since workers are unmated, the eggs that laying workers produce are unfertilised and so develop as drones 1. There may be other explanations for these singleton pupae e.g. workers moving eggs up from the brood box. However, this doesn’t explain why they are almost always drones 2. Sometimes you’ll find a super packed with brood in all stages … wall to wall eggs, open and sealed brood. This happens when the queen has somehow sneaked above the queen excluder. When this has happened to me I usually put it down to a lack of attentiveness in checking the underside of the queen excluder when opening the box. 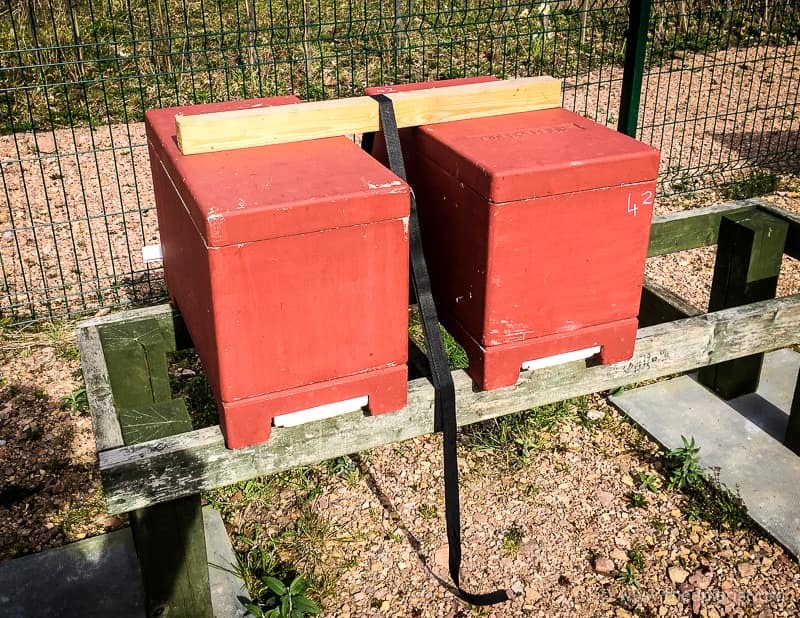 If the queen was on the underside and the QE is leant against the hive stand she can easily wander round to the other side, thereby giving her access to the supers. 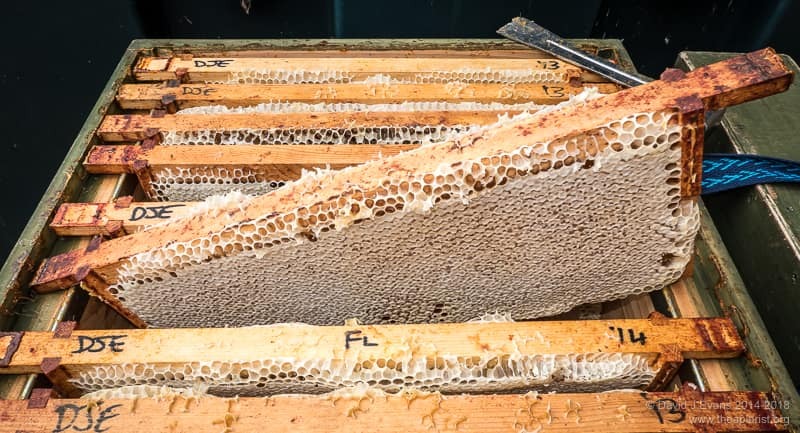 While checking supers for extraction last month I found one box – the lowest super of a stack of three – contained two or three frames with small amounts of clustered brood 3. Another example of inattentiveness? Possibly, but there were some oddities about this colony. Firstly, there was no open brood … just eggs and sealed brood. I uncapped a few cells and the pupae were all just at the purple eyed stage. This is day 15 for workers and day 16 for drones. Since eggs hatch after 3 days this means that there had been a gap of at least 12 days when the queen wasn’t laying. Secondly, there was both worker and drone sealed brood present, but it was on separate frames. There was no drone brood in worker cells, which have characteristically domed caps 4. Finally, I checked the brood box. 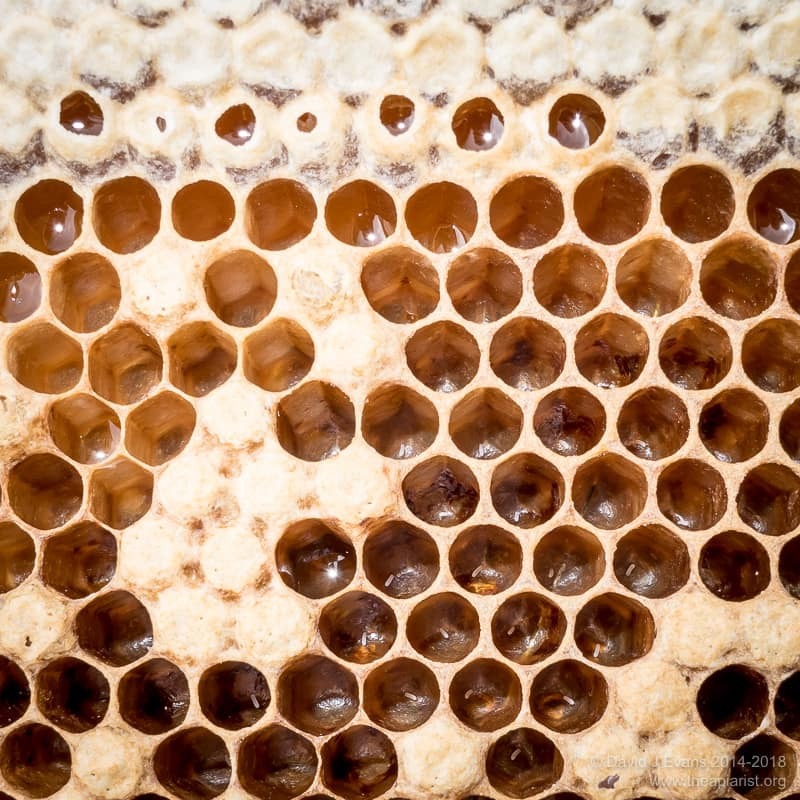 There was plenty of brood in all stages – eggs, larvae and sealed pupae – in a busy hive. However, I didn’t see the queen (who was nominally marked and clipped) but by this time I was in a bit of a rush. Some of these apparent oddities have a straightforward explanation. The separation of drone and worker brood is because I use a range of different frames in my supers – worker foundation, drone foundation and foundationless. They start as matched boxes, but over the years have got completely mixed up. All the drone brood was in a super frame originally drawn from drone foundation. However, why was there brood at all in the super if the brood box contained the laying queen? Or should that read a laying queen? Perhaps there was another queen in the super? Aside from speculating about how she got there, or – if she was the original queen in the box – where the one ‘downstairs’ came from, there’s also the puzzle about why she’d taken a 12 day holiday from egg laying. And where the hell was she now? She’d been in the top box sometime in the last 3 days (because there were eggs present). However, although I’m reasonably good at finding queens, I searched in vain in this super (and the two above) and couldn’t find her. Carefully looking through ~30 super frames takes time and I was running out of both time and patience. These three supers were ready for extraction and I still had half a dozen colonies to check. I could continue looking and eventually find her … if she was there at all. If she wasn’t, I’d obviously never find her. I shook all the bees off the super frames – directly over the brood box5 – and took them away for extraction. I’m a great believer in Occam’s Razor. The simplest explanation is probably the correct one. I reasoned that there was probably one queen in the box. Any other explanation was going to get convoluted. If there was only one queen she was either in the brood box or the supers. If she was in the brood box then all was well. If she was in the supers she’d hopefully end up in the brood box. There was little point in using a clearer board if the queen was in the supers. Firstly, with brood present many bees would probably remain. Secondly, if the queen was present in the supers, they’d definitely not clear. There was a blue marked and clipped queen in the bottom box when I checked the colony a few days later. She was (still) laying well. I suspect that the queen excluder was faulty or damaged. It was a wooden-framed wire one. If the wires were prised apart during cleaning or through carelessness the queen could get up into the super. She could also therefore return to the brood box. The 12 day gap in laying was probably explained by the queen returning to the brood box during this period. The two short stints when she’d been ‘upstairs’ hadn’t noticeably left gaps in the brood pattern in the brood box – she might have only nipped up for a few hours or so. There were only a few hundred cells with eggs or pupae in the super. The exception to this are the Cape honey bee Apis mellifera capensis which have some weirdo adaptations (which is easier to spell than thelytokous parthenogenesis which is the scientific explanation) that make them worker laying workers. I’m loathe to say always drones as someone will inevitably prove me wrong … however, I don’t remember ever finding individual worker brood above the queen excluder in the supers. The two other supers were all capped and ready for extraction. Laying workers or a drone laying queen typically produce these. From which the QE had been removed. 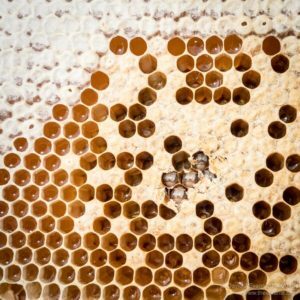 This entry was posted in Beekeeping, Behaviour, Honey, Queen failure on August 10, 2018 by David. I once had a colony I thought might be queenless. No brood or queen in the brood box for a few weeks running, yet the colony was calm and they did nothing with a test frame. I hadn’t bothered looking at the supers much. Of course she was in the flipping supers. Doh! Anybody who has kept bees for a reasonable time will be too familiar with the situation. I had instances last year of a fully developed open queen cell in a super. I assumed the workers had taken it up out of reach of the queen. Later the colony superseded the queen. I always check supers now, just in case. Also I regularly take uncapped ‘dry’ honey from my hives and carry a refractometer in case of doubt. Presumably they didn’t supercede with the queen raised in the super?! I do the ‘shake test’ as it’s pretty accurate and seems reliable when subsequently tested with the refractometer. OSR is often harvested before capping. 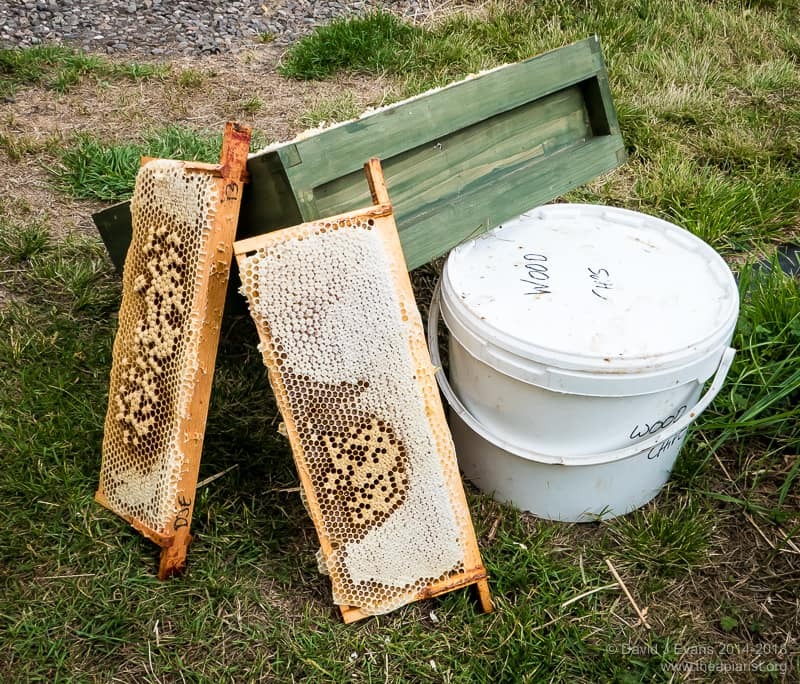 I know others who give half-capped frames a quick spin and feed that lot back to the bees, or use it for mead.